There have been dozens of books written about filmdom’s first megastar, Charlie Chaplin, from Chaplin’s own My Autobiography to Walter Kerr’s landmark study of silent film comedy, The Silent Clowns, to David Robinson’s definitive biography, Chaplin: His Life and Art, to Jeffrey Vance’s beautiful coffee table book, Chaplin: Genius of the Cinema. While these books and many others have been excellent, they tend to fall into two basic categories--biographies or film studies. Dan Kamin’s new book, The Comedy of Charlie Chaplin: Artistry in Motion, is something different altogether. It is a examination of Chaplin’s art, focusing on what made his films so compelling to audiences of the time and what continues to make his work captivating to new generations experiencing his silent films in the modern era. This is not merely a film study. It is a study of Chaplin’s performances and the way he used the motions of his body to create timeless comedy. The author is uniquely qualified to analyze and break down Chaplin’s body movements, as Dan Kamin is a professional comedian and mime who developed the physical comedy sequences for the films Chaplin (1992) and Benny and Joon (1993) and who trained both Robert Downey Jr. and Johnny Depp for their roles. 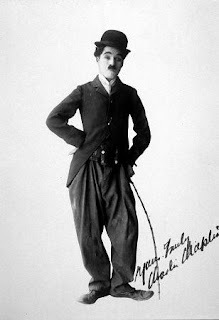 Through Mr. Kamin’s in-depth analysis of Chaplin’s body movements, The Comedy of Charlie Chaplin: Comedy in Motion had an effect on me that no other book on Chaplin and his films has produced--it made me look at the comedian’s work in a new way. Just as the outtakes presented in the Kevin Brownlow and David Gill’s breakthrough documentary Unknown Chaplin provided a new understanding into the way Chaplin improvised and directed his films, Mr. Kamin’s book provides new insight into the comedian’s compelling performances. 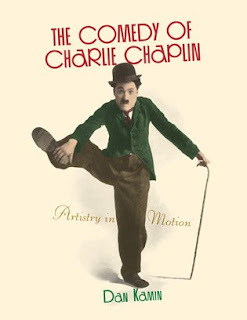 Of course, the book is much more than a detailed examination of Chaplin’s movements. It also features coverage of the comedian’s theatrical work and how he utilized and adapted his stage training when entering the movies, a detailed examination of the comedian’s gags (including a breakdown of eight specific categories of Chaplin’s signature transformation gags in which he treats one thing as another), a look at the comedian’s evolving character and the changing cast of characters that surrounded him as his films became more mature, an extensive analysis of how Chaplin dealt with the problem of adapting his comedy to the new medium of sound films, and a brief overview of the challenges Mr. Kamin encountered in trying to train Robert Downey Jr. to move like the great comedian for the film Chaplin. Taken as a whole, I found The Comedy of Charlie Chaplin: Artistry in Motion to be the best examination of Charlie Chaplin’s art in book form. While I can find no criticism to level against Mr. Kamin’s masterful analysis of Chaplin’s art, I have one small gripe when it comes to the book itself. The publisher has chosen to only publish the title in a library-bound edition, which has been priced for the library market. While the book is solidly bound to last beyond a single lifetime and the laminated hardback cover is resistant to spills that would damage books made of lesser materials, the $65 price tag may discourage many readers from picking up this beautiful, insightful book. However, since this is a reference that film lovers will want to revisit again and again, the care that went into producing the book is appropriate. I hope that fans of Charlie Chaplin will overlook the hefty cost, because those that make the investment will find their money well spent. Finally, I should mention that The Comedy of Charlie Chaplin: Artistry in Motion will also be of great interest to soused cinema enthusiasts, because Mr. Kamin delves deeper than previous authors into Chaplin’s soused slapstick. A complete chapter, “Drunk Again,” is devoted to Chaplin’s sozzled solo performance in the brilliant short One A.M., and many of Chaplin’s other alcohol-related classics such as Mabel’s Married Life, The Cure, Payday, The Idle Class, City Lights, and Limelight receive in-depth coverage. 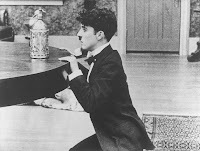 Mr. Kamin explores the seeds of Chaplin’s drunken characters in the fabled “Mumming Birds” sketch that Chaplin performed prior to film stardom when traveling with Fred Karno’s theatrical comedy troupe; and he examines how Chaplin used balance and body motions to play such an effective drunk. Fans of “booze movies” and lovers of film comedy should consider Dan Kamin’s book an essential read. It receives my highest recommendation. The countrified cocktail of comedy and car chases that was The Dukes of Hazzard had a huge impact on popular culture. Not only did the series span seven seasons on CBS, the show spawned a spin-off series, a Saturday-morning cartoon, two TV reunion movies, and a feature film remake. 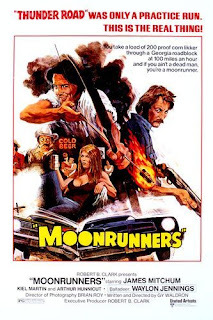 However, four years before the Duke boys first burned up the dirt roads of Hazzard County, creator Gy Waldren experimented with the premise, writing and directing the drive-in flick Moonrunners. The film focuses on another pair of troublemaking cousins, Bobby Lee Hagg (Kiel Martin) and Grady Hagg (James Mitchum). After Bobby Lee is released from one of his many stays in the county jail, he heads home, picking up a pretty girl (Chris Forbes) along the way. Bobby Lee plans to resume running moonshine with his skirt-chasing cousin for their Uncle Jesse (Arthur Hunnicutt), but when he arrives, he finds that trouble’s brewing. Jake Rainey (George Ellis), the local boss and owner of a bar/brothel, has been consolidating all of the moonshine operations in the county for a cartoonishly attired New York syndicate. Uncle Jesse, being a perfectionist when it comes to the quality of his whiskey, refuses to sell his white lightning to Rainey, considering it a sin to mix his delicately aged brew with the swill that Rainey peddles. Of course, car chases, run-ins with bought-off lawmen, and explosions are the unavoidable result. Moonrunners contains many of the elements that would eventually lead to the success of The Dukes of Hazzard--rabble-rousing cousins, fast cars, a pretty girl in tight pants, Uncle Jesse, a Boss Hogg-type character, Sheriff Rosco Coltrane, and even narration by balladeer Waylon Jennings. However, the pieces don’t quite fit together in the original film. First of all, the Hagg boys are less likeable leads than the Dukes. Bobby Lee is written and played as a near-sociopath who gets into dangerous situations, employs violence, and destroys property for the fun of it. And James Mitchum, hired likely for his connection to the king of all drive-in moonshine movies Thunder Road (1958), sleepwalks through the role of Grady. The story’s conflict also poses a problem in that there isn’t much of one. The Hagg boys both believe that Uncle Jesse is being pig-headed in his stand against Jake Rainey; so it is hard for the audience to get invested in the cousins’ cause when the characters aren’t. Jake Rainey also doesn’t make a solid villain in that he likes the Haggs and often tries his best to keep his old friend Jesse from getting hurt. Out of all of the film’s features, Waylon Jennings fares best, and it is easy to see why his narration became an integral part of the subsequent series. Truth be told, Moonrunners isn’t much of a “booze movie.” It only makes the list due to the fact that alcohol is an essential component of the plot. Unfortunately, moonshine is talked about and driven around much more than it is actually consumed (a common fault of most moonshine movies). 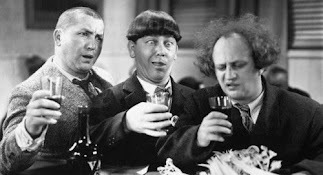 The Hagg boys even go so far as to boast that they never drink the stuff themselves. In general, moonshine movies tend to be pretty lackluster, but Moonrunners is a below average example of the genre. I would not recommend watching this flick on its own merits. However, it can be fascinating when looked at in comparison to the series that it would eventually influence. Potent Quotables--PREACHER: That’s sinful, Jesse. I’ve been tellin’ you that for years. Usin’ your god-given talents for makin’ demon whiskey. JESSE: Makin’ fine liquor is the only talent God gave me, Preacher. It would be sinful not to use it. Besides, in all them ten commandments, God didn’t say one single word against drinkin’. Although he had a right smart to say about nearly everything else. PREACHER: Wine is a mocker. Strong drink is ragin’, and whosoever is deceived thereby is not wise. --Proverbs 20, verse 1. JESSE: Give strong drink unto him that’s ready to perish and wine unto those that have heavy hearts. Let him drink and forget his poverty and remember his misery no more. -- Proverbs 31, verse 6 and 7. BOBBY LEE: (Laughs) Preacher, you ought to know better than to argue Bible with Jesse. Video Availability--Moonrunners has never been released on video, but Yammering Magpie Cinema has a collectors copy available on DVD. The DVD is full frame and the video quality is VHS-level at best. However, you may have no other opportunity to check out this rarity. The DVD isn’t yet listed on Yammering Magpie’s Website, but it can be purchased by contacting them at this link. Similarly Sauced Cinema--James Mitchum first ran moonshine in the drive-in classic Thunder Road (1958).